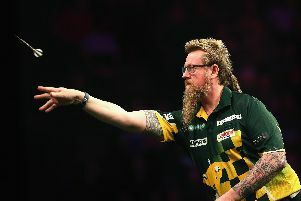 Simon Whitlock fired a 12-dart leg on his way to winning week three of the Portsmouth Individual League. The Wizard beat Jon McCoubie in the semi-finals before overcoming Rob Collins in the final. Collins saw off Ricky Williams in the last four. Callum Francis won the plate contest, beating Lee Smith into runners-up spot. Francis triumphed against Ross Hughes in the semis while Smith beat Bob Crawley. Steve Harradine also threw a 12-darter while Francis hit a 164 check-out and Buster Turner notched seven 180s. In the Bishop’s Waltham & District League Wheatsheaf whitewashed Shedfield SC 8-0 in division four. Linden Tree B and Black Dog B enjoyed 6-2 victories. An impressive performance from Linden saw them see off Acorn SC B in their match. That proved to be quite a comprehensive win for Linden. Then it was the same story really for Black Dog B. They got the better of Fox & Hounds were a determined display. Priory B were not in such good form. They struggled to get on terms and were beaten 5-3 in their match against Acorn SC C.
The semi-finals of the men’s pairs competition will be contested between these duos. Steve Perren and Glen Hawkins are through while Dave Hayes and Dale Grove are also there. Dave Witts and Luke Haines team up, while Paul Wolfe and Dave Cross make up the pairs. A guaranteed £300 top prize will be up for grabs at the Flights for Cancer charity darts tournament on Saturday, August 18 at Waterlooville’s Phoenix Club. Entry costs £10 with players divided into eight groups in a round-robin format before the top four in each group progress to a knock-out contest from the last 32 onwards. Doors open at 10am and players have until 11.15am to register.